For most Nigerian fashionistas, Kente material is as significant as Ankara fabric. Kente is used in a variety of women’s styles, but it looks especially majestic in long gowns. 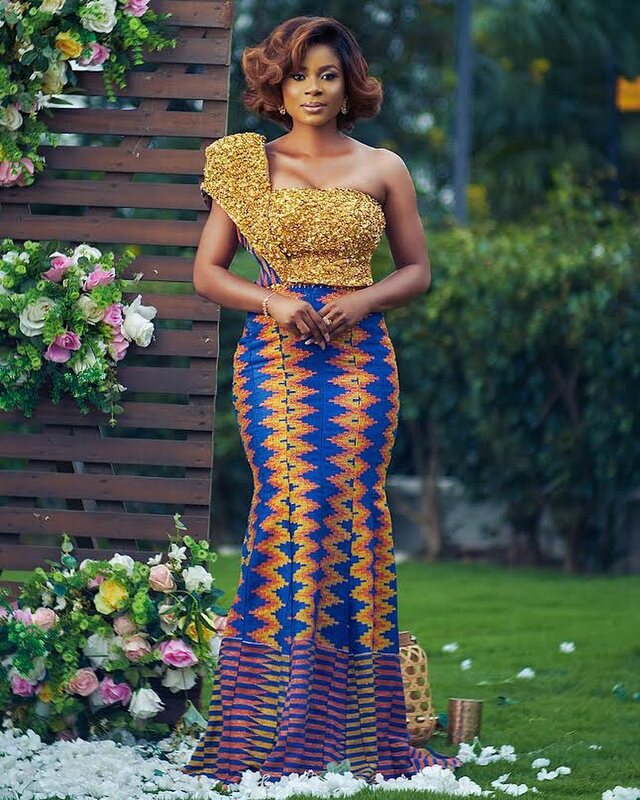 Check out 15 best Kente long dress styles! 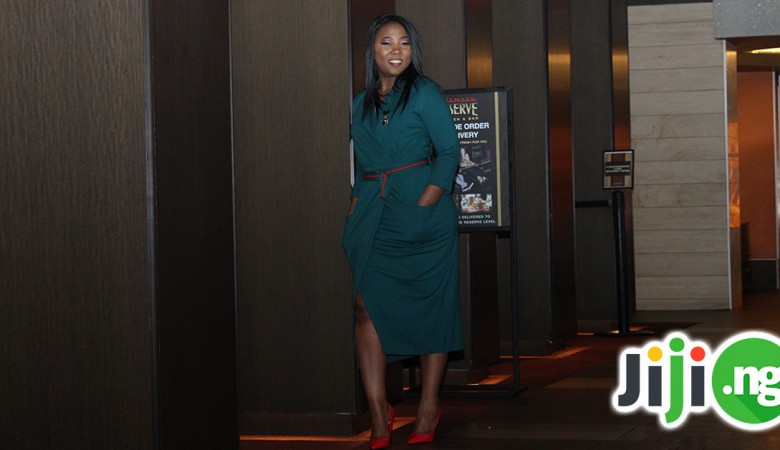 Kente dresses work great with traditional designs, but one of the biggest benefits of this fabric is that it also looks fabulous in modern dresses. 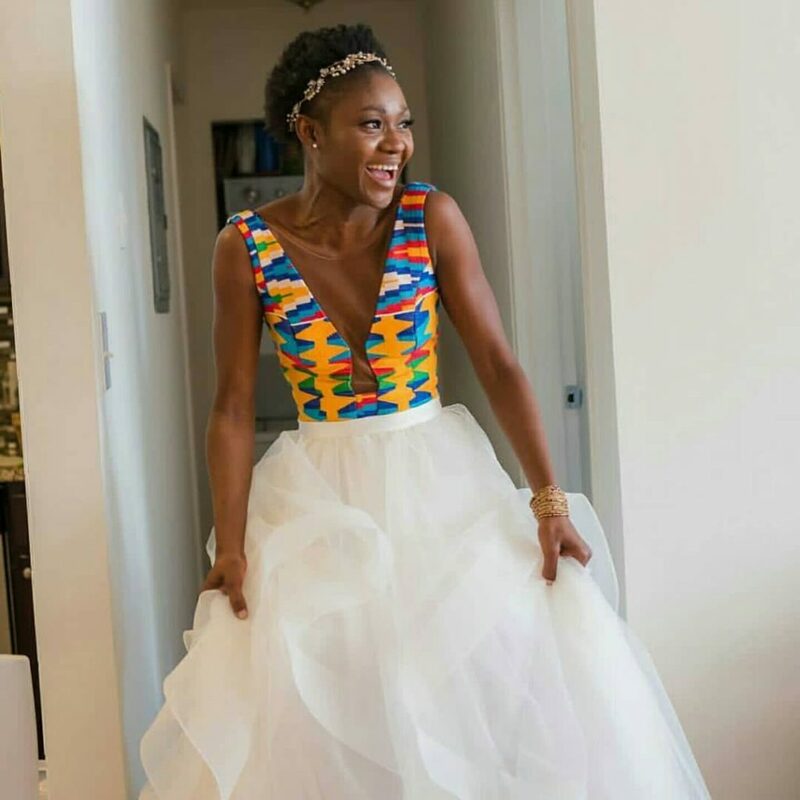 This one-shoulder Kente gown with a gold bodice is the best proof there can be! The geometric nature of the Kente cloth couldn’t have been a better choice for highlighting the curves of African beauties. Plus, the strategically placed cutouts also make the model’s figure appear absolutely flawless. 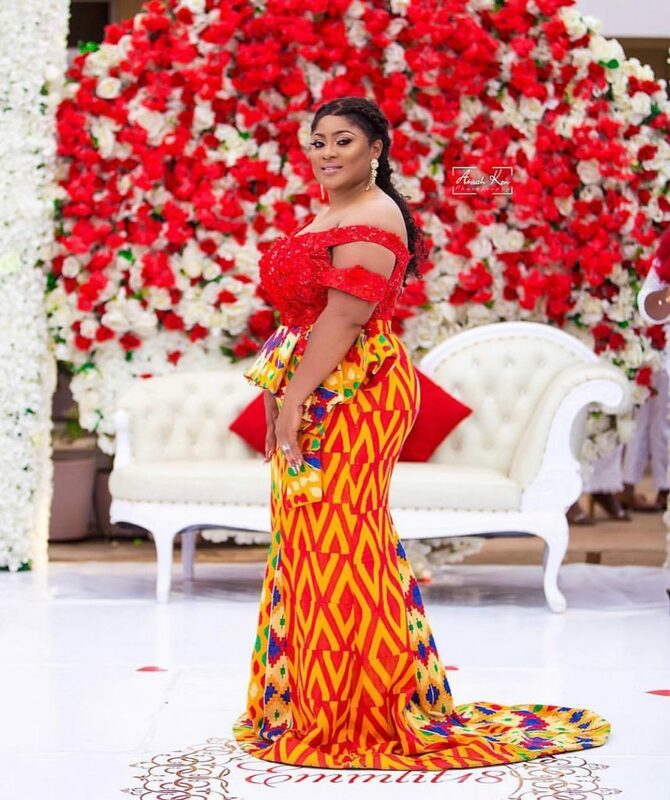 Thanks to the sophisticated pattern and elegant colour scheme of the Kente fabric, it can be successfully used even in the most exquisite dress designs. The gorgeous train of this gown will surely be a part of fashion history! Ghana Kente styles are so versatile that you can easily pair Kente with any other pattern of your choice to create a mix and match look. The fabrics don’t even need to complementary to deliver the desired effect! 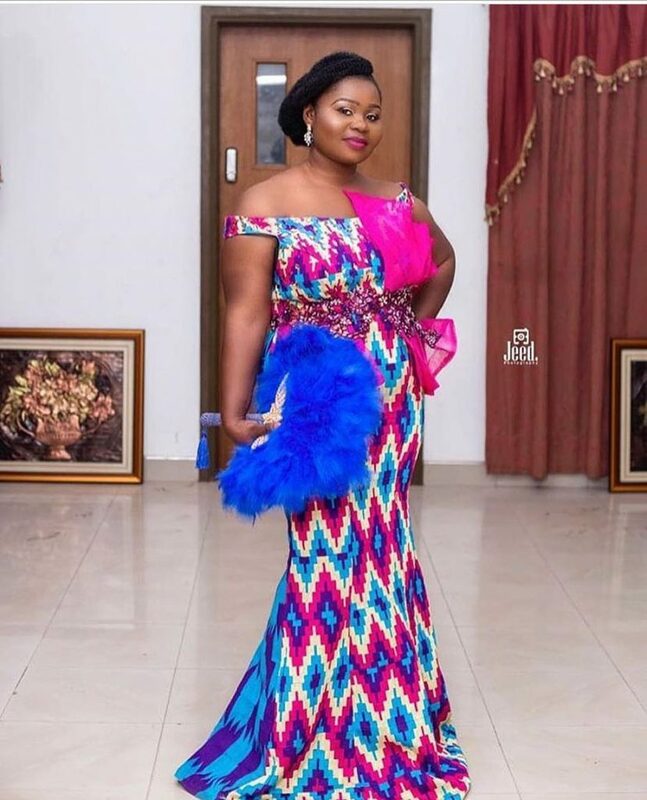 Another example of how great Kente styles for ladies look when paired with other fabrics is this fabulous dress, which combines two of the favourite things in Nigerian fashion – Kente and lace. 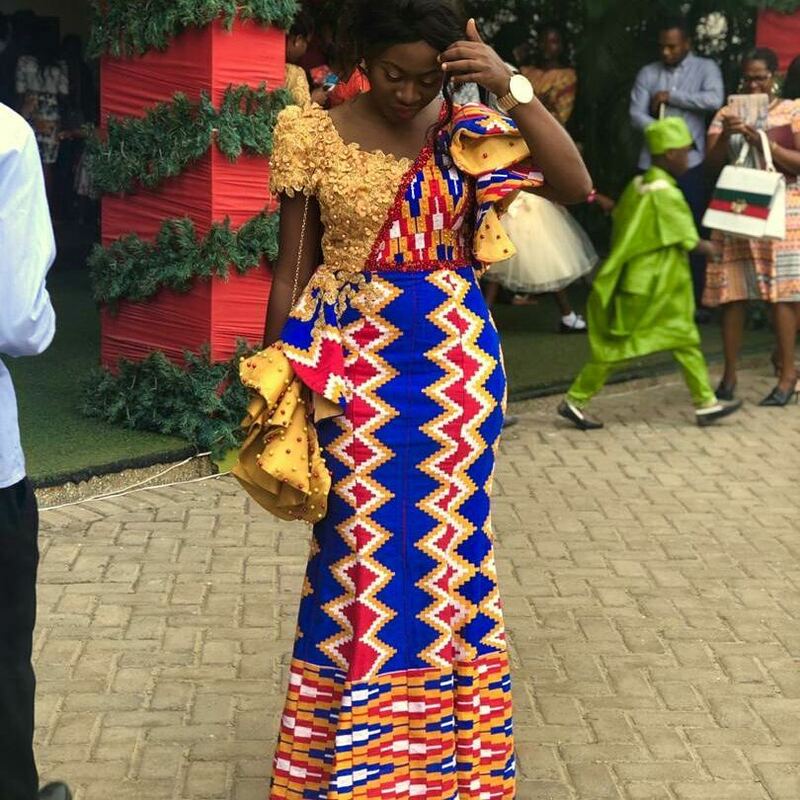 Ghana Kente fashion loves pairing Kente with other fabrics and colours. The asymmetric design of this dress, which features beautiful gold 3D fabric, will certainly inspired hundreds of other ladies to try this look. 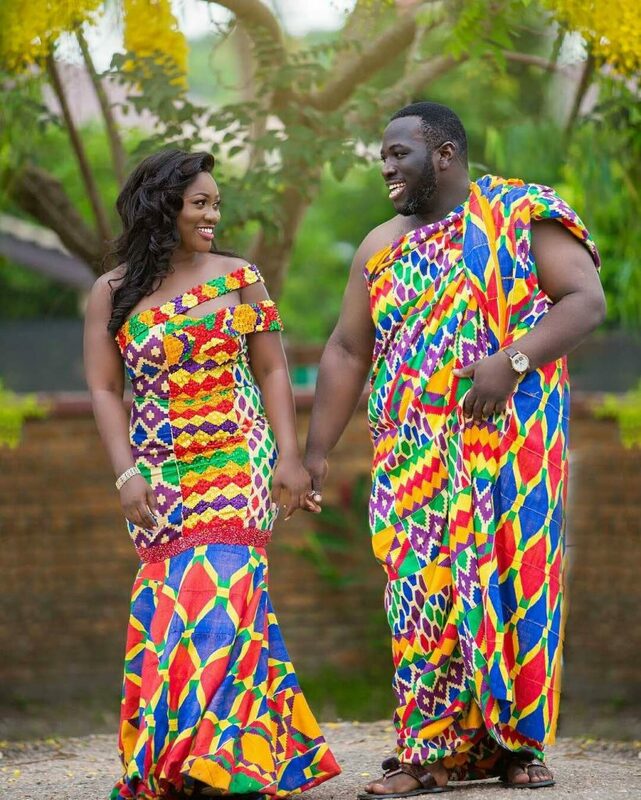 If you truly love Kente styles, you will like the idea of including Kente fabric into your wedding gown! 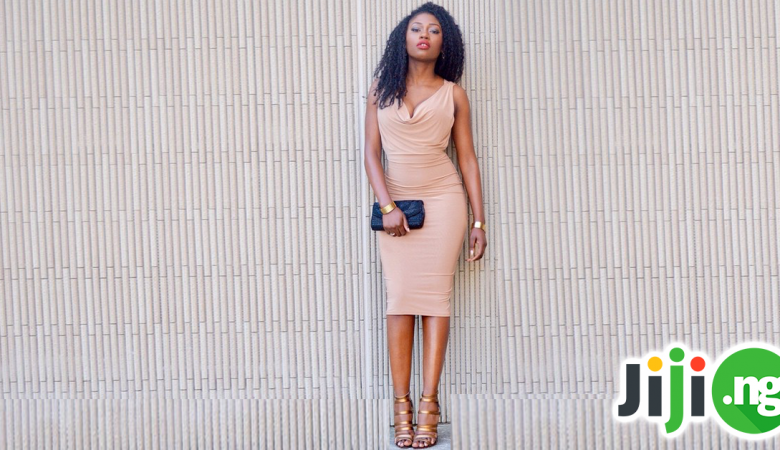 You don’t need to make the whole dress out of Kente – this material works great as an accent. 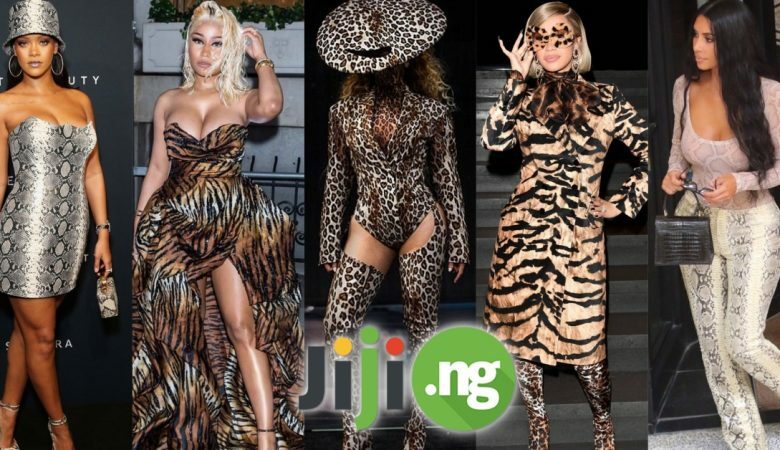 Peplum remains one of the most popular ways to decorate a gown in Nigeria, and peplum looks especially striking if it unites two different elements of the gown in one beautiful design. 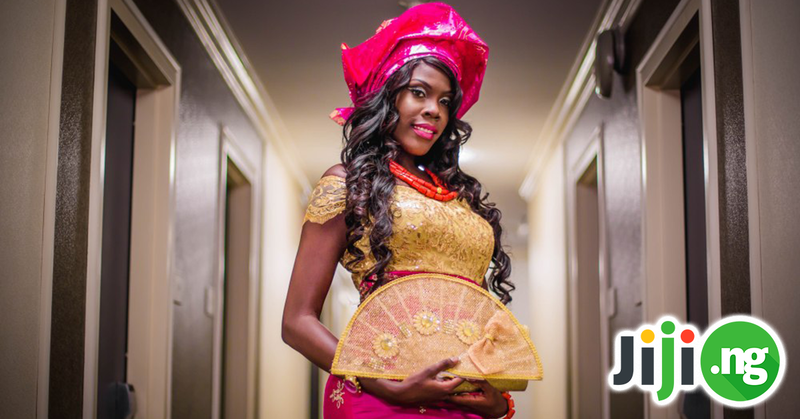 More and more Nigerian couples decide to have their pre-wedding photoshoot in traditional wear. 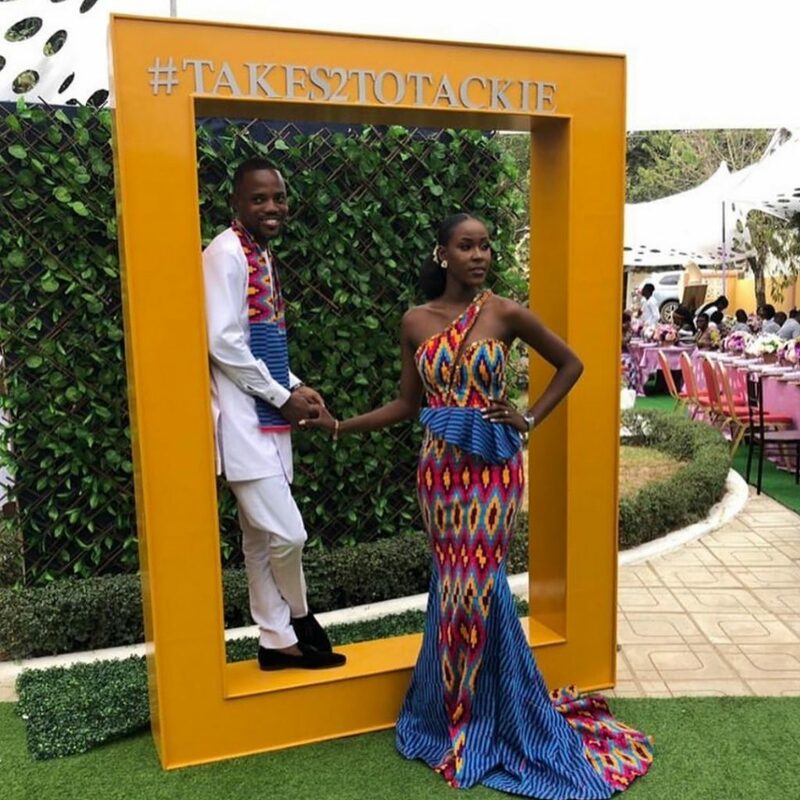 Kente outfits work great for this purpose – they are timeless, colourful, and look awesome in photos! 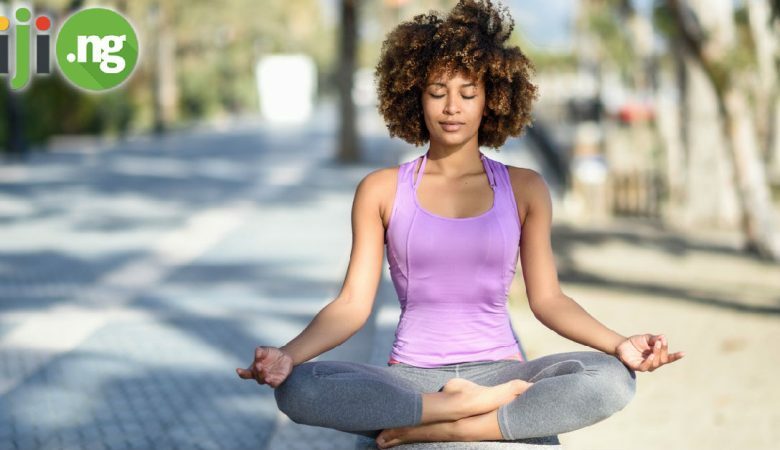 If you are in a mood for a princess gown for a really important event, you can combine your love for native fashion with a classic ball gown cut. 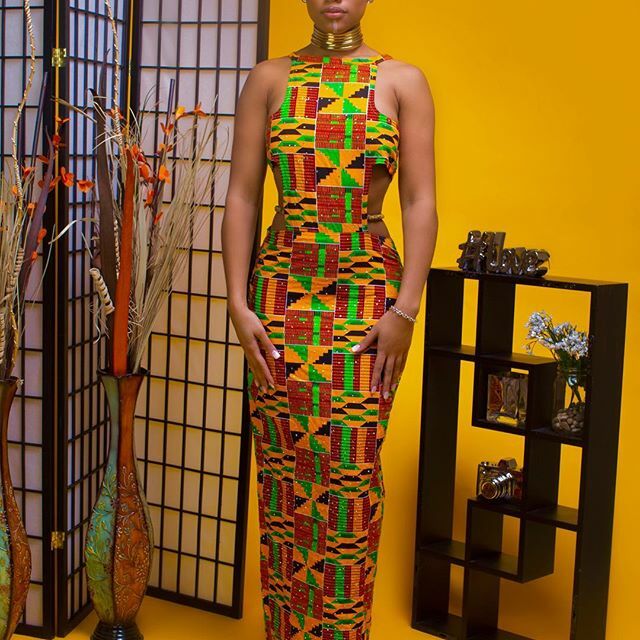 Kente fabric looks stunning as an accent in this dress! Off-shoulder dress designs only get more popular every year, and this year they are not going anywhere. 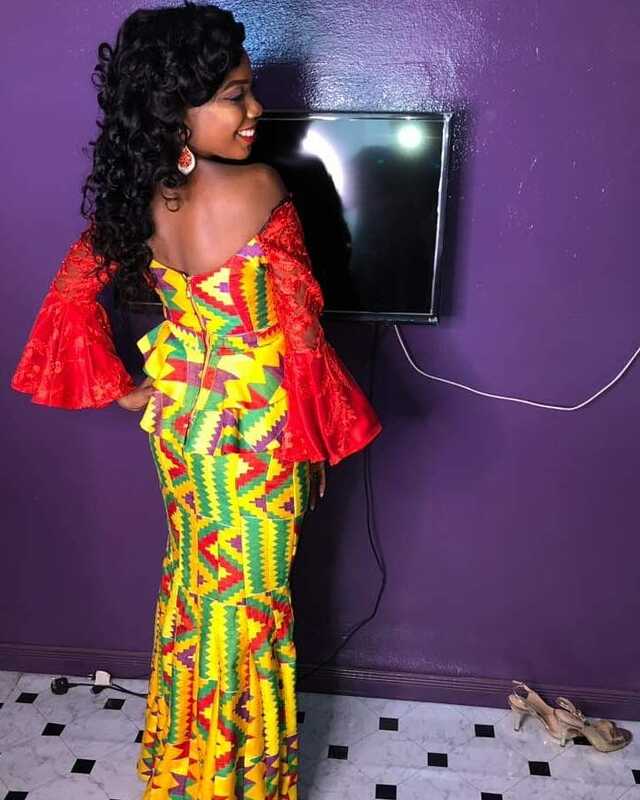 If your wardrobe is in need of an upgrade with an off-shoulder gown, check out this beautiful Kente dress! 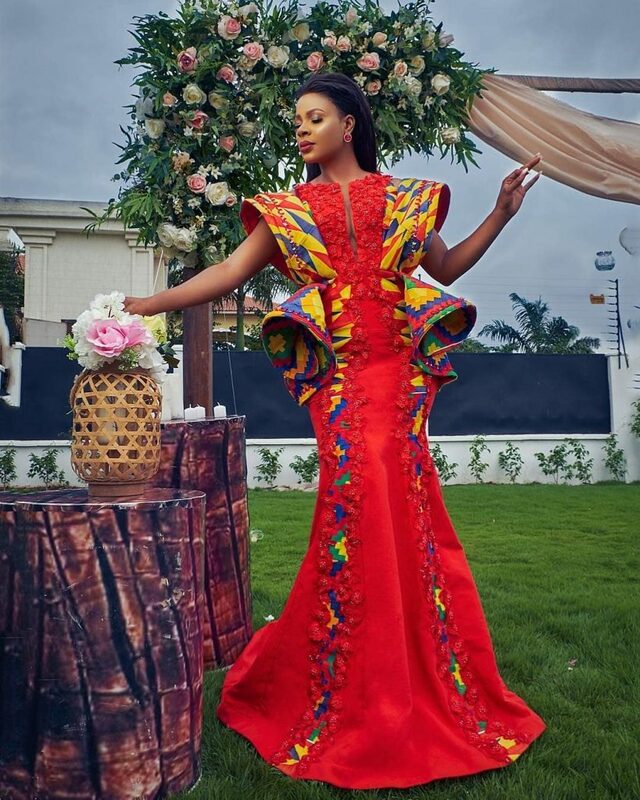 Using the colour blocking technique for your new gown and combining Kente with a solid-coloured fabric brings out the best in both materials and give your dress an exquisite look. Halter neck dresses have recently come back into vogue, so if you don’t own any dresses in this design, it’s about time to add one to your collection! Kente patterns work great for these dresses. 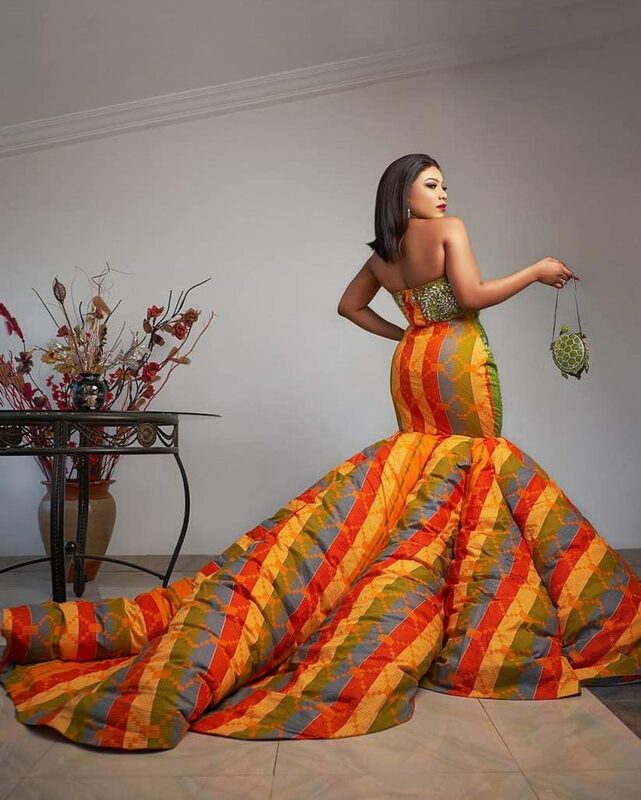 Sometimes Kente gowns look pretty accessible and easy to recreate, but sometimes they look truly like works of art. 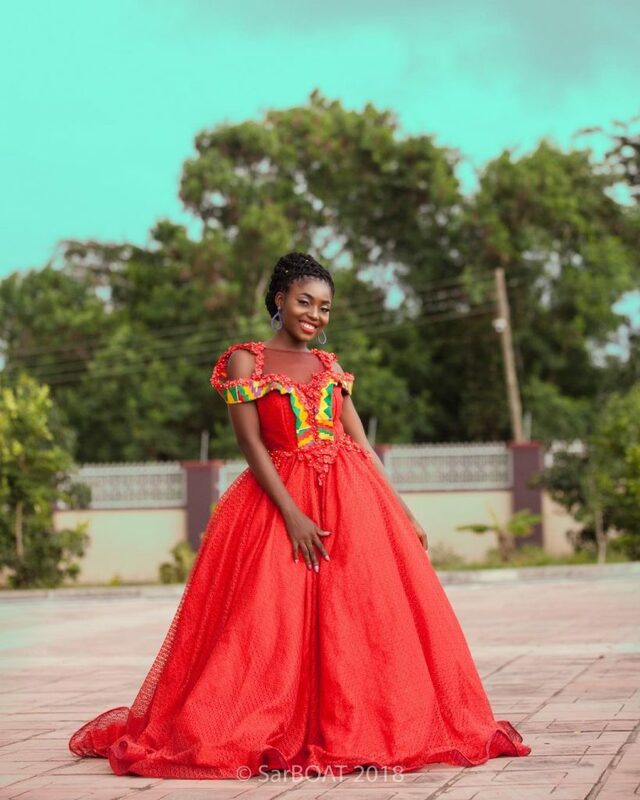 This red gown with Kente accents definitely falls into the latter category! 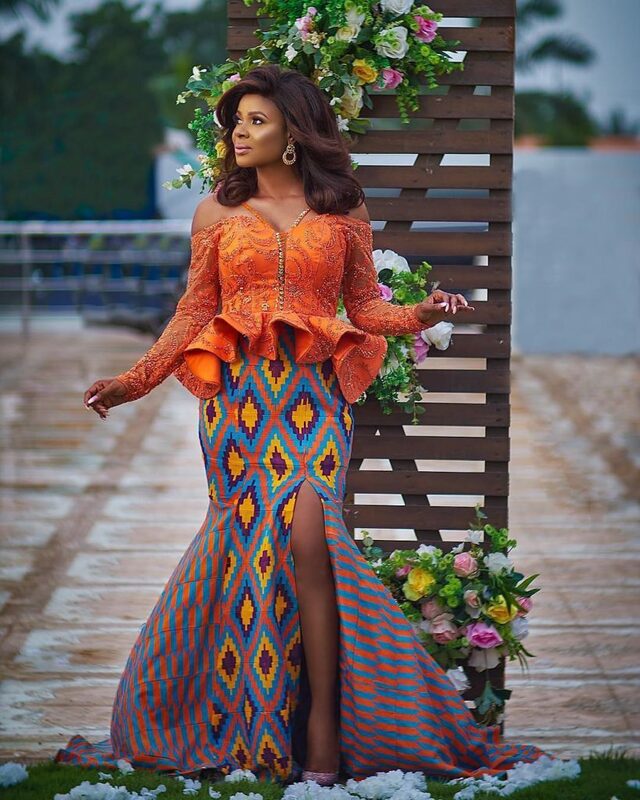 Colder seasons cannot be imagined without at least one long-sleeved gown, and this dress with a lace bodice and Kente skirt with a high slit is one of the best ones to get this year.